Each week we produce a chart book of 10 of the current positions we have in our equity portfolio. Specifically, we are looking at the positions which warrant attention, or are providing an opportunity, or need to be sold. While the portfolios are designed to have longer-term holding periods, we understand that things do not always go the way we plan. This monitoring process keeps us focused on capital preservation and long-term returns. 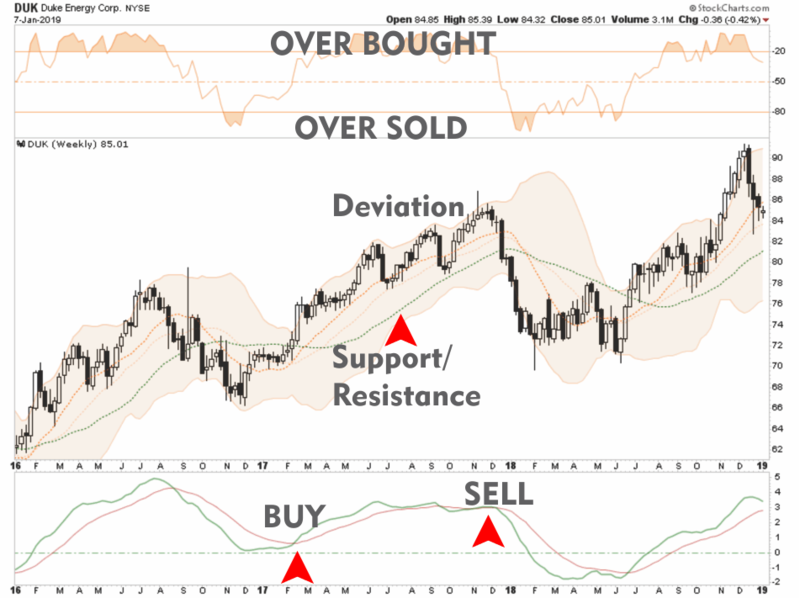 When the price of a position is at the top of the deviation range, overbought and on a buy signal it is generally a good time to take profits. When that positioning is reversed it is often a good time to look to add to a winning position or looking for an opportunity to exit a losing position. ABT rallied and broke out to a new high. We are currently up nearly 10% in the position and with a “buy” signal approaching we will use weakness to add to the position accordingly. Stop-loss moved up to $70. Like ABT, AEP has also broken out to new highs. We currently only carry a 1/2 position in AEP so we will add to the position on any weakness that doesn’t violate support. Currently, with a bit more than a 9% gain, we are tightening up stops. Looking for opportunity to increase exposure opportunistically. Trade war…what trade war. Our basic materials holdings have been burning it up lately. After taking profits in DOV and buying VMC, DOV has continued to rally busting out to new highs. More importantly, DOV is switching back onto a buy signal which will allow us to add to the position on some weakness. Looking for a suitable position to swap into. After adding FDX to the portfolio, it has rallied and we are carrying about a 12.5% gain. FDX is still on a longer-term “sell” signal and is wrestling with short-term moving average resistance which keeps us cautious. HCA has rallied nicely since we added it to the portfolio. Currently we are carrying 1/2 position with a 4.75% gain in just a couple of weeks. We are looking for some weakness to add to our position that doesn’t violate our stop-loss. They say “buy what you love” and I am loving “Oreo” cookies. We initially bought 1/2 postion in MDLZ hoping for an opportuntiy to build into it. The stock hasn’t given us that opportunity yet. However, with MDLZ now on a buy signal, and up almost 16% since our purchase, we will wait for a bit of a consolidation or pullback to add our second half to our holdings. MDLZ has broken out of a very long consolidation pattern which suggests substantial upside remains from current levels. However, we are tightening up stops to protect our profits. Following a good earnings report, MMM rallied into resistance at the long-term moving average. We stated last week, MMM needed to move above resistance to add to the position. It did that this week, so we will look to add to the holding. The sell signal has also reversed back to a buy so we are getting much more bullish on MMM in the short-term. NSC rallied sharply this week taking us to a 20% profit on our holding. With a buy signal fast approaching we will look to add to our holding on a pullback or consolidation that doesn’t violate out stop loss. Stop-loss is tight at $170 currently. PG broke out to all-time highs and gained traction which is very bullish. We are currently only carrying 1/2 position with a and will look to add on a pullback to support that doesn’t violate our stop. This past week we added 1/2 position of UNH to the portfolio. You will notice we like health care a lot in our portfolio. UNH had pulled back to support and bounced nicely off of it yesterday. Currently on a sell-signal (bottom panel) but is beginning to improve.